The presence of an error in a stage of the transfusion chain can have serious consequences to the recipient of blood or the blood products. If the blood transfusion can save the lives, it also includes some risks, in particular the infections transmission by the blood. The screening of transferable infections by the blood transfusion, in order to exclude the blood donation presenting an infections transmission risk from the blood donor to the recipient, is a critical stage of the process aiming to guarantee the best transfusions security. A best screening of the frequent and most dangerous transferable agents by the blood, can reduce the transmission risk to very weak levels. This study aimed at optimizing the blood transfusion security of the patients, with the determination of the seroprevalence of transferable infections by the blood, notably the HIV, the B hepatitis, the C hepatitis and the syphilis among the blood donors in order to reduce meaningfully their impact in hospitable environment. The screening of transferable infections by the blood transfusion in the blood donation represents one of the components of the strategies to assure the transfusion security and the blood availability. The first step to ensure a supply of sure blood products and to minimize the infections risk, resides in the collection of blood to the voluntary donors correctly selected and belonging to populations with weak risk, in particular those who give regularly. The prevalence of transferable infections by the blood transfusion among the voluntary donors is generally weaker than among the family member's donors and the remunerated donors. The weak prevalence of transferable infections by the blood transfusion in the donors population permits also to reduce the quantity of blood donations rejected and therefore to improve the efficiency and the use of resources available. 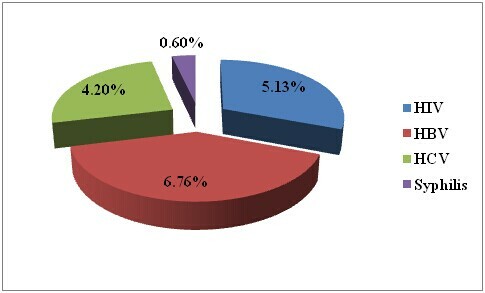 In this study, the seroprevalences of infections to human immunodeficiency virus (HIV), hepatitis B virus (HBV), hepatitis C virus (HCV) and Syphilis among the blood donors have been estimated respectively of 5,13% 6,76% 4,2% and 0,46%. These results showed that the infection to HIV which attracts more the attention of the population and the health staff is not the most dominant in hospitable environment. The infection to hepatitis virus especially the one to hepatitis B virus is frequent and also deserve a big attention, in order to reduce the post-transfusion accidents and the residual risks transmission of these infections by the blood transfusion. Additional co-authors were:Octavie Danielle Moankong Fak from Department of Biomedical sciences of Ngaoundere University of Cameroon; Armel Herve Nwabo Kamdje from Department of Biomedical sciences of Ngaoundere University of Cameroon, Charles Fokunang Ntungwen from Faculty of Medicine of Yaounde I University of Cameroon; and Alexandre Michel Njan Nloga from department of Biologicals Sciences of Ngaoundere Cameroon. A paper about this study has been published in the Science Journal of Public Health.